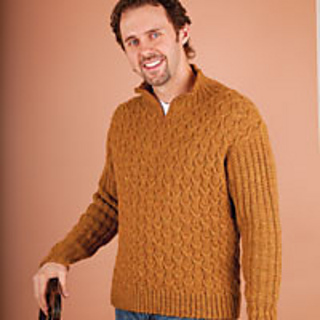 Small l(Medium, Large, 1X, 2X, 3X, 4X) with finished bust/chest measurement of 43 (47 ½, 52, 57)"
Originally published as “His and Hers - Men’s Pullover“” in * Love of Knitting, Fall 2011. 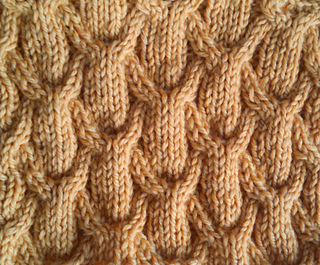 Here’s a sweater design with enough pattern texture to keep you (the knitter) engaged while not being so overwhelming that your favorite guy won’t wear it. Sized for Man’s Small through 4X (S-XL sizes in magazine only? ), The Weekender is a piece you’ll borrow from his closet often. And don’t let the zippered neck scare you! For a perfect finish, simply pin the zipper tape into place, and then hand-sew it on using matching thread. Easy-peasy.